This grammar exercise will help you practice the Spanish accent mark rules. Accent marks are confusing to many students, who do not know where to place an accent mark in a word, or whether a word carries an accent mark at all. 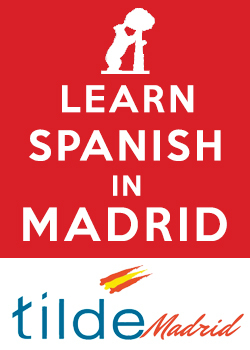 Although it may seem tricky, the Spanish accent mark rules are very simple, and the students in our Spanish classes in Madrid learn this very fast. In fact, you only have to follow two steps: identifying where the stress in the word is and having a look at the last letter of the word (have a look to our Spanish grammar book for a schematical explanation). Step 1: Where is the stress in the word? The first step is to divide the word into syllables and to identify where the stress lies. When a word is pronounced, one syllable has a stronger stress than the rest. For example, in “Au-to-bús” the stress is in “bús”, in “Co-che” the stress is in “co”, and in “He-li-cóp-te-ro”, the stress is in “cóp”. The stressed syllable is the last one (“palabras agudas”), such as “autobús”. The stressed syllable is the next-to-last (“palabras llanas”), such as “coche”. The stressed syllable is the third-to-last (“palabras esdrújulas”), such as “helicóptero”. Step 2: What is the last letter of the word? When the stressed syllable is the last one(“aguda”), and it ends in vowel (a, e, i, o, u), “n”, or “s”, the accent mark has to be written (i.e., “camión”, “café”, “quizás”), otherwise there is no accent mark (i.e., “español”, “dormir”, “Madrid”). When the stressed syllable is the next-to-last (“llana”), and it ends in vowel (a, e, i, o, u), “n”, or “s”, there is no accent mark (i.e., “amigo”, “resumen”, “lunes”), otherwise you have to write the accent mark (i.e., “difícil”, “azúcar”, “lápiz”). When the stressed syllable is the third-to-last or further (“esdrújula”), the word does always have an accent mark (i.e., “sábado”, “teléfono”). Step 3: Practice the Spanish accent mark rules! Download this free grammar exercise and put this into practice. You already trained words which are “agudas” on the last grammar exercise for Spanish accent mark rules. 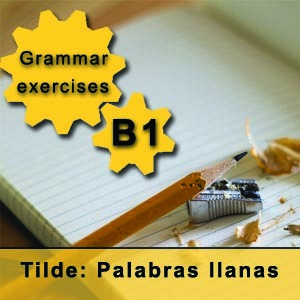 In this case, you will be practicing words which are “llanas”, and on our next post we will bring you an exercise to practice words which are “esdrújulas”. Keep posted, as at the end there will be an exercise mixing all of them! 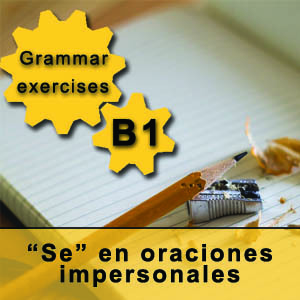 Let us know your opinion on this exercise, in our Madrid Spanish school we love to hear your feedback.